Lena Celeste Barlett, 83, of Greenville, Pennsylvania formerly of Shenango Drive in Pymatuning Township, passed away on Tuesday, November 13, 2018, at St. Paul's in Greenville following an extended illness. She was born in Montgomery, Alabama on October 10, 1935, to the late John Holland and Celestine (Turner) Merrill. In addition to her parents, she was preceded in death by a son, Michael M. Barlett; a grandson, William E. Barlett; and a sister, Ann Smith. Celeste was a 1954 graduate of Sidney Lanier High School in Montgomery, Alabama. She worked as a floral designer for Kraynak's in Hermitage and Gibb's Flower Shoppe in Farrell. She also loved making floral arrangements at home, for family, friends, and her church. 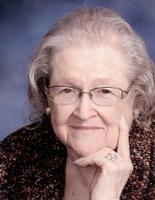 She was a member of Clark Trinity United Methodist Church, where she was very active in missions. Celeste was a three-time Worthy Matron of the Greenville Chapter of the Order of the Eastern Star, and most recently belonged to the Mercer Chapter. She was also a member of the Greenville White Shrine. She served as a den mother when her boys were active in scouting, and she enjoyed tatting. Celeste is survived by her husband at home, Verne E. Barlett. They were married on Easter Sunday, April 10, 1955. Also surviving are: three sons, Gregory A. Barlett and his wife, Judy, of Brunswick, Ohio, Douglas E. Barlett and his wife, Sheri, of Transfer, and Jeffrey H. Barlett and his wife, Sandra, of Mentor, Ohio; four grandchildren, Melissa Sue Martino and her husband, Tom, of Sharon, Samantha Lynn Kantner and her husband, Kevin, of Greenville, Meghan Lynne Barlett of Sharpsville, and Gregory Michael Barlett of Brunswick, Ohio; and a great-granddaughter, Isabella Rose Martino of Sharon. Visitation will be held on Saturday, November 17th, from 10:00 am - 1:45 pm at Osborne-Williams Funeral Home & Cremation Services, Inc., 73-75 Columbia Ave., Greenville, where an Eastern Star service will begin at 2:00 pm, followed by a funeral service, with Reverend William Locke of Clark Trinity United Methodist Church in Clark, officiating. Burial will be held at Rickert Church Cemetery, Transfer, Pennsylvania. can be shared at www.osborne-williams.com.